In the football season, Sundays are often the only day when I get chance to really cook. But when I’m going through my, erm, time of the month, I get very indecisive and can’t decide what to cook out of all the wonderful ideas out there. This week I spent ages deliberating and in the end decided to go with something from The Millennium Cookbook, by Eric Tucker. Even though I’m English I’m lucky enough to have been to Millennium in San Francisco three times, and loved it every time. The books are something of a challenge though. I can’t always get the ingredients, and even when I can, all the recipes seem to contain 2 or 3 other recipes, making them pretty hard work. When I picked it out I didn’t realise that the curry paste recipe was on another page. Fortunately I always have a basic home made green curry paste in the freezer so I used that instead. It had similar ingredients to the one in the book so I’m thinking it was an OK substitute. I made the sauce and the barley salad in advance, between the 2 televised games, so all I had to do before the meal was the aubergine and the veg. I chose oyster mushrooms, courgette, green beans, red pepper and beansprouts. Disconcertingly, the veg recipe required you to add some curry sauce that wasn’t listed in the ingredients. I just took a guess and used a bit of the sauce I’d prepared earlier. All in all, it was a real success. It tasted fresh and zingy, and it went well with the Californian pinot noir we’d picked out. The barley was a nice texture instead of the rice you’d expect with Thai curry and the flavours all went together well. I’d definitely make it again. Ah ha! 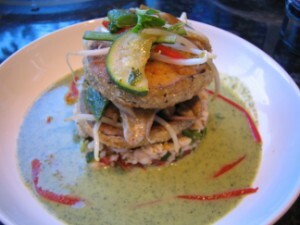 I see you’ve made the thai green aubergine curry stack that caught my eye this morning. Jolly fine it looks too. It certainly makes me want to try it now, so I’ll let you know how I getz on. Gill. I’ve made some other things from the book before I started on the blog. I’ll have a look tomorrow what they were. You’ve inspired me to get both books out again so thanks! You’ll find that if you go to the PPK message boards and search, some people have made lots of other things and have pictures of them too. If you can cope with yet another vegan book, Voluptuous Vegan is not the same level as Eric Tucker but definitely worth a look. I’ll look out for that book too. And hunt out ppk. Cheers again.